Found at the base of southern Europe in the Mediterranean, Italy is composed of the main island along with the islands of Sicily and Sardinia - as well as numerous other smaller island groups. 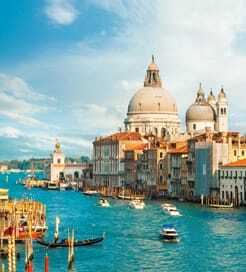 There are several things to do in Italy aside from visit its numerous museums and Roman ruins; Italy is famous for its fashion capital Milan, its canals in Venice, its vineyards, and the dramatic ruins of Pompeii. Restaurants, shopping centres, cafes, bars and nightclubs are all commonplace throughout the country, giving the visitor a wide variety of choices. It’s not just the culture and sightseeing opportunities that attract the tourists to Italy though. A Mediterranean climate, thousands of kilometres of coastline and sandy beaches attract sun seekers from all around. Italy is perfectly situated for arrival by ferry with frequent and cost effective services on offer. Whether you are travelling to the mainland or looking for onward travel to any of the famous islands such as Sardinia, Sicily, Elba, Ischia or Capri as well as some of the less well known destinations of the Aegadian, Pontine or Aeolian Islands you are sure to find a crossing to suit your plans. Ferries sail to Italy from virtually all surrounding countries with connections offered from Slovenia, Croatia, Montenegro, Albania and Greece in the Adriatic and Ionian Sea while from the other side of the country you can travel from Spain, Tunisia, Malta and Morocco. The major ports to the north east and east side of the country include Venice, Ancona, Bari and Brindisi. The shorter crossings along the Istrian coast tend to use small passenger only vessels whereas on the longer trips, for example from Greece or Albania, you’ll tend to find that the ferries are larger and with more amenities which results in a more enjoyable on-board experience. On the other side of the country you’ll find ports running from Genoa and Savona in the north, along the coast down to Livorno, Civitavecchia (Rome), Napoli and Salerno. International services depart from Barcelona, Tangier Med and Tunis. The crossings are generally pretty long in terms of time at sea, but are very popular and run regularly. Due to their popularity of these crossings, you’ll generally find more than one company to choose from. If you’re looking to travel on to an Italian island then again you certainly won’t be short of choice with numerous ferry companies, routes and departure times on offer. The main ports on the Western coast of Italy take you to all of the key destinations. Generally you’ll find that the port geographically closest to the island you’re heading to is going to be the main port of departure, the exceptions being the larger islands of Sardinia and Sicily which are reachable from all of the major ports along the west coast of Italy. For more information, please visit our Ferries from Aeolian Islands to Italy page. For more information, please visit our Ferries from Montenegro to Italy page. For more information, please visit our Ferries from Capraia Island to Italy page. For more information, please visit our Ferries from Aegadian Islands to Italy page. For more information, please visit our Ferries from Giglio Island to Italy page. For more information, please visit our Ferries from Hvar Island to Italy page. For more information, please visit our Ferries from Pianosa Island to Italy page. For more information, please visit our Ferries from Slovenia to Italy page. For more information, please visit our Ferries from Pontine Islands to Italy page. For more information, please visit our Ferries from Kefalonia to Italy page. For more information, please visit our Ferries from Tremiti Islands to Italy page. For more information, please visit our Ferries from Algeria to Italy page. For more information, please visit our Ferries from Morocco to Italy page. For more information, please visit our Ferries from Zante to Italy page.